As the depth of the MTA’s financial crisis has come into focus, I’ve written extensively on advertising options that aren’t being exploited underground. Each time I discuss advertising, I run across a few people passionate about their dislike of possibilities of more subway advertising. I started this advertising exercise last July when I suggested that the MTA explore full-station branding options. We could have a Times Square station sponsored by Disney or a Yankee Stadium stop sponsored by Adidas. We’ve seen station-wide poster campaigns, but truly branding a station could result in a windfall for the MTA’s coffers. I’ve also discussed floor-to-ceiling ads for subway cars. We’ve seen this in the 42nd Street Shuttle, and while these cars are not alway aesthetically pleasing, these types of advertising campaigns exploit available surface space. Some people find them ugly; some find the implementation to be less than ideal; but money is money. Last week, the MTA unveiled another potential ad campaign in its infancy: Much like buses, the MTA will begin to sell advertising space on subway car exteriors. According to The Post’s Patrick Gallahue, the Shuttle will once again serve as the test for new forms of advertising. Some cars are running Continental Airlines posters to complement the internal ads, and if this campaign is successful, the MTA may look to expand this form of advertising to other train lines. Again, I am all for this type of thinking. If the MTA can capture additional revenue this way, then so be it. If you don’t like it, thank Sheldon Silver and the State Assembly Democrats for derailing congestion pricing. Thank Mayor Bloomberg for his poor PR campaign in support of his PLANYC2030 measures. Over the last ten years, the MTA has nearly tripled its advertising revenues from $37 million in 1997 to over $105 million in 2007. With purse strings in New York tightening, the agency needs the money anyway it can get it, and outside of a fare hike, advertising is the best route for revenue. Some of the cars on the Hudson-Bergen Light Rail are “wrapped” in exterior ads and the world has not ended. It’s a good idea. No, the “world has not ended”, but at the same time yet another part of public space has been reduced to a rolling billboard. You like ads? Flip through a magazine or watch some on your iPod or whatever. It’s not a matter of liking ads. I like ads a lot more than I like fare hikes. Don’t fool yourself: you will end up with both. This week, the handful of remaining New Metro North RR Haven Division Bar Cars are getting their interiors superficially refurbished with advertising copy in the form of tropical -bamboo-and-palm-tree-sunset vinyl overlays, which will cover the otherwise horrible-looking original interiors (They do have a certain charming but badly worn-out early-60’s design esthetic). Those cars, which cater to a relative few (but fiercely defensive of their PM bibulation) passengers, have not seen upgrades since approximately the second Reagan term, because the railroad doesnt prioritize maintaining cars that carry so few revenue passengers. I totally agree with you-in Hong Kong, they even use in-station televisions, mounted on the walls opposite platforms, to display ads and info messages! Comes with sound as well! Some trains are even plastered with advertising on the outside, and when you ride on the hundreds of escalators available, small, 9×14 sized ads adorn the walls! But the odd part is, not all of the ad space in the NYC subway system is used up-some stations, the ad space is blank! I agree with everything you said but if the folks at the Roosevelt Island Operating Corporation ever start slapping ads on the outside of the Tram I will mourn it as a loss to a true NYC icon. Inside the cabin would not bother me but outside would be a loss. Just my opinion. Whats the big swing? Buses have been getting wrapped in Australia for a number of years now. No doubt they have been in other countries too. @ herenthere re: in-station tvs. I spent a few months in Valencia, Spain in 2006 and they have these also. They give all manner of things happening in national and international news, current affaris, sports, local events, and 3rd party advertising. In fact, they had the same thing in the elevator to take me to my apartment. I presume it is not that uncommon as the apartment block itself was average enough. PATH is supposed to start putting video screens in stations and the newer trains – giving news, weather, and advertisements – to bring in some revenue. NBC Universal is supposed to run the thing and just pay a flat fee to PATH. This replaces the PATHVision system that’s out there now. I believe the MTA doesn’t want outside agencies messing with the inside and outside of their subway cars and buses, so they try to operate the advertising business and hang the signs themselves. I suspect this is why we see so many blank advertising panels on the subways and in stations, and why we saw ads on the subway for a televised Justin Timberlake concert months after it had past. I’m all for finding new sources of revenue, but I’m just not convinced they can pull this off successfully. I grew up in NYC in the 70’s/80’s when the subway cars were all decorated in the grafitti/soot motif. 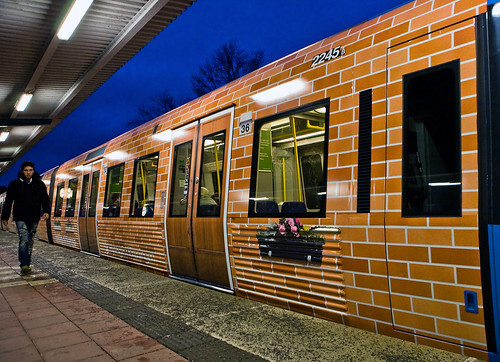 Even though the subway cars are a thousand times cleaner now, I think a little color would be a nice change of pace over the current stainless steel/weathered aluminum look that most cars carry. Will it happen? Probably not…can you imagine the MTA managing that task alone…it would not be pretty. To anyone who values the aesthetics of the present exteriors and feels the need to protest any any changes to it’s grimy metallic charm I ask this: Would you really prefer the next fare increase to arrive sooner ? I don’t know about you, but given the opportunity to hang on to my cash a little long, I would not mind if my ride looked like a 45 ft. long NASCAR racer. That’s spurious logic. The next fare increase will come no matter what. I guarantee you in 5 years the fare will be quite a bit higher. Will it be higher and look like the inside of some horrible, garish pinball machine? Or will it be higher and us commuters have something normal to look at. When you mock people who “value the aesthetics of the present exteriors”, you’re missing the point. The point isn’t that the outside of a train, or the walls and floors and ceilings of a subway station are “beautiful” — the point is that they’re NEUTRAL. They’re not trying to influence your thoughts. They’re not trying to raise your “brand awareness”. They are what they are. Think about how many ad messages you see every day. You ignore them, right? Of course you do. But a lot of us would rather not be surrounded by crap we have to consciously tune out. Today it’s wrapping plastic crap around every surface they can get away with. Tomorrow (and I guarantee this) it will be sound and moving images you CAN’T ignore. All the while justifying it with the comparitively paltry sums they pay to do so. Maybe some sheep don’t have a problem with this, but a lot of people do. These are OUR trains. As taxpayers and fare-payers, they belong to the public. And yet here the MTA is selling our attention to advertisers who want to force us to look at their products. I’m sick of this trend. Public space is public space. It should not be for sale. I like looking at things that are not ads. I like to look at a wall and have it be a wall. I like having the space to think my own thoughts instead of always having a commercial message crammed down my throat. Your “money is money” argument doesn’t wash. How much do you want to bet that the State will reduce MTA expenditures if revenue is “found” in new ways? Today’s wrapping of static ads on every conceivable surface will yield to video EVERYWHERE soon enough. Watch — video technology is getting cheaper and cheaper. You want to live in a Bladerunner-esque nightmare? Good for you. I do not.